Jared Unzipped: I can not eat the cheese. I can not eat the cheese. A few days ago while taking my normal, everyday morning walk, a startling revelation occurred to me. Let me preface the scene. 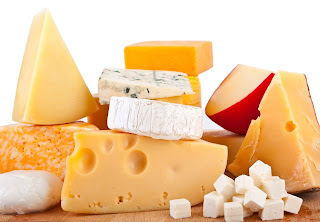 Sometime in early June, Crystal dared me to go a month without eating cheese. Now don't get me wrong, I actually eat pretty healthy. No junk food, no sodas, nothing. I'm quite healthy for my size -- no diabetes, no high blood pressure, my cholesterol is very good. Cheese is my "Achilles' Heal", though. I didn't think there was any way I could do it. I L-O-V-E cheese. Cheese is what makes my culinary world spin 'round. CHEESE! Anyway, I accepted her challenge. The first week was tough. Then the second week -- that was tough, too. By the time I reached week three, I started to think I could get through the month-long ordeal. Eventually, I succeeded and completed a month. How in the hell did I do it? I'm not sure, to be honest. I just stuck to my guns and did my best to drown out the constant craving. I didn't think I'd ever pull it off, but somehow I managed. Even to this day, I find myself avoiding it. My mind will create new and more extravagant reasons why I shouldn't eat cheese, even when I have the option to do so. And let's be honest -- in my attempt at losing weight, not eating cheese has certainly helped. I can not eat the cheese. I can not eat the cheese. I CAN NOT EAT THE CHEESE! Literally, I was jumping for joy and picking my walking pace up (which is already a brisk, speedy walk to begin with). A flash of instant genius went off in my brain. If I can not eat the cheese, I can do anything I set my mind to. That being said, all of the physical activity is paying off. My weight has dropped (though I still find myself not believing the scale) and my mood has started to improve. More so than physically healing myself, my exercise is a means to shed off emotional baggage. So much of my weight problem stems from old emotional trauma -- I improperly ate as a child to bury my feelings and abuse. By letting go of all this weight, I'm setting myself free. I want to eat you... but I don't have to.